The picturesque Mukden Palace in Shenyang is renowned as a site of great historical and cultural interest. 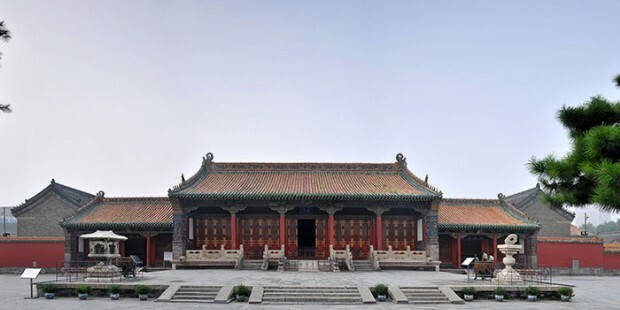 Visitors will immediately notice the venue’s resemblance to Beijing’s Forbidden City, and in fact the edifice at Shenyang predates this famed compound. The attractive Mukden Palace was the residence of the emperors of the Qing Dynasty prior to their conquest of the other parts of China and the relocation of the capital to the city of Beijing. Although the Mukden complex is neither as well-known nor as large as its corresponding royal edifice in Beijing, it is recognized as a splendid example of the design principles of its time. Also known as the Shenyang Imperial Palace the compound at Mukden was constructed in 1625 and served as the residence of the first three emperors of the Qing Dynasty. Since the demise of monarchy in China, the buildings have been converted into a museum which attracts many visitors each year. The early construction at the site commenced at the time of rule of Nurhaci. In subsequent years during the reign of Emperor Huang Taiji, more buildings were incorporated into the complex. The compound in fact is said to depict Tibetan and Manchurian design elements, making it a unique construction. After the relocation of the capital to Beijing, the palace at Shenyang lost its position as the emperor’s principal residence. Instead the compound became a regional residence. However in 1780 the complex was further developed by Emperor Qianlong. Later Qing Emperors habitually spent some time at Mukden Palace every year. In the year 1955 the palatial compound at Mukden was restructured as the Shenyang Palace Museum. Meanwhile in 2004 it became a feature of the UNESCO World Heritage List as a parallel site with the Forbidden City in Beijing. Anyone with an interest in Chinese history and traditions will find Mukden Palace to be a fascinating site. Here you will gain an authentic insight into the mode of life of the Chinese emperors. Travellers interested in serviced apartments in Shenyang will find a pleasing choice in the Somerset Heping Shenyang. This quality apartment Shenyang offers provides comfortable accommodations with a number of amenities.